The Science and Technology Education Program focuses on a different approach to learning. The program consists of a selection of specially-designed courses that develop students’ problem-solving and critical thinking skills through interactive learning opportunities. In STEP, students learn while experimenting, analyzing, designing, and building. 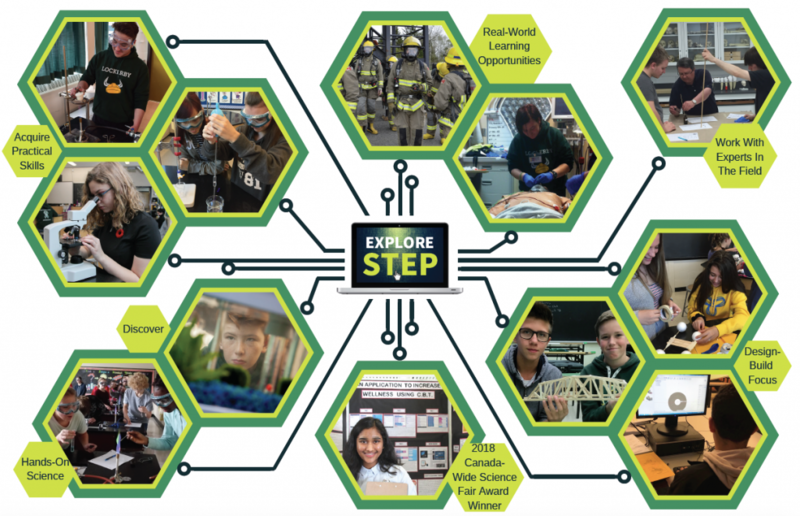 As a result, STEP students gain a deeper understating of the course content, in a more engaging way, while developing a variety of transferable learning skills. 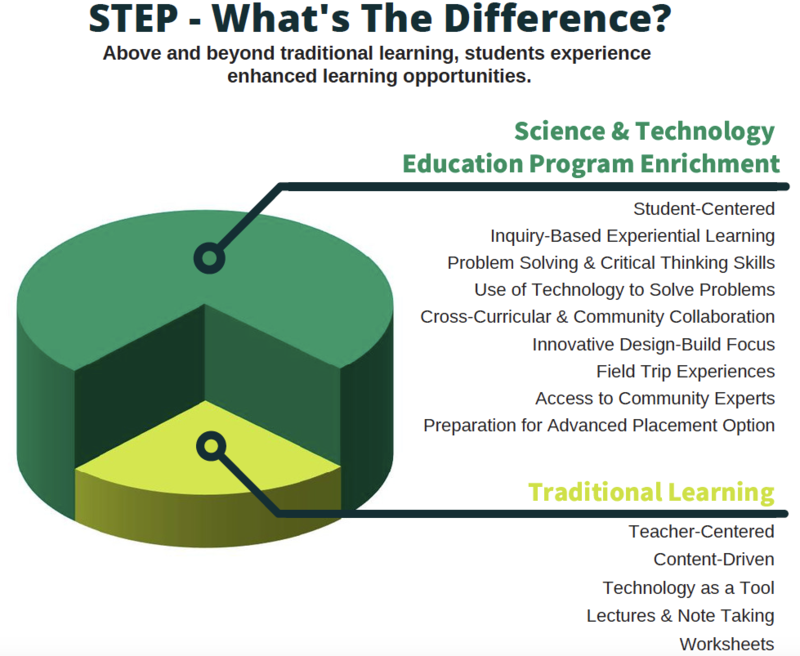 STEP focuses on the integration of science and technology to teach students about the interconnectedness of learning and the importance of applying their skills to all aspects and areas of their education. Exposure to a technology-rich environment, field trip opportunities, and community experts further enhances students’ learning experiences. If you are thinking of a career in science, engineering, design, or health care, the STEP program may be for you. Rainbow District School Board that provides free transportation to Lockerby Composite by bus for students who live anywhere in the school board’s region, provided students are out of the designated walking distance boundary. Upon the successful completion of this program (grades 9 through 12), students will receive a STEP certificate. This certificate in addition to students’ ongoing portfolio of work can be used in selection of students for particular programs at the post-secondary levels. Are you a STEP student? If you are academically motivated and want to learn in a classroom with like-minded students, then the STEP program is right for you. To be eligible for admission, the student must have an overall average of 75% (Level 3+) in grade eight. 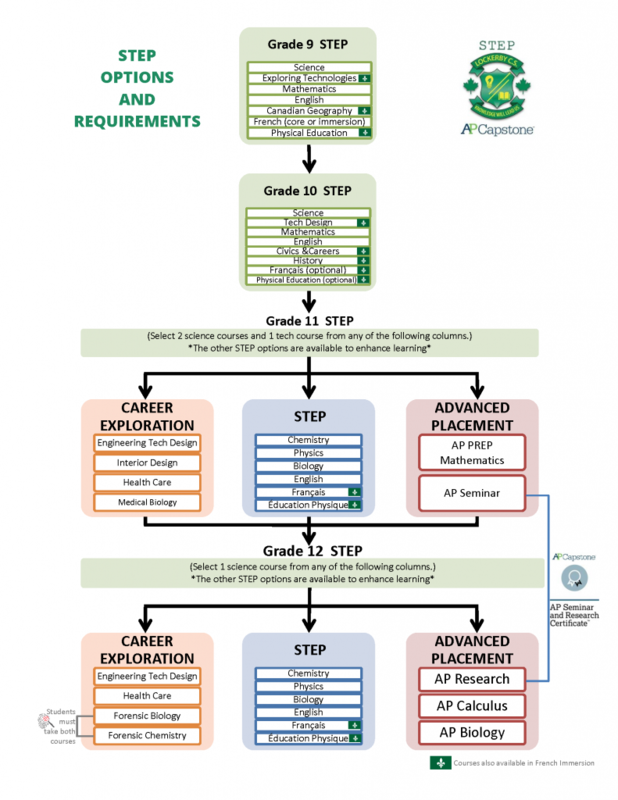 To apply, download all of the relevant documents from our website or come to the school to pick-up a package. Finally, don’t forget to consider the Laptop Program option which is available only to STEP students (see below). If you’re thinking of applying to the STEP program at Lockerby, then you may wish to consider the STEP Laptop Program as well. You use your own laptop in special courses, including English, Geography, Science, Math, and Technological studies. A very popular option among STEP students is the Laptop Program. 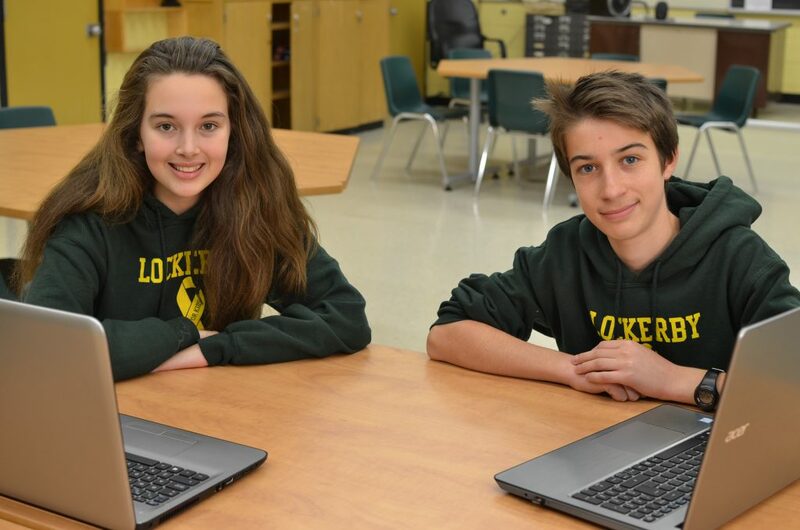 In fact, over 400 Lockerby students are in the laptop program. The laptop option is also available in French Immersion. Our program is not to be confused with those of other schools or those offering Bring Your Own Device (BYOD) programs. At Lockerby, the goals for students are productivity and skill development- these cannot be achieved by tablets and cell-phones alone. Lockerby recommends that you purchase or lease a recognized brand laptop. We also recommend the purchase of an extended warranty and insurance. The insurance may cover costs not covered by the warranty such as loss or damage. Ask your vendor for a commitment regarding the repair period. Will they provide a loaner if needed? Laptop Bag: Briefcase style only. Maximum size: 50cm long, 40cm high, 20cm thick. For health and safety reasons, no backpacks are allowed in the classrooms. Lockerby’s Laptop Learning Program is committed to ensuring accessibility for all. For this reason, we are pleased to support Open-Source software and Freeware which is available at no cost. Parents/Guardians are free to purchase their own application software if they desire but it is not necessary. The ONLY software you must purchase is the operating system. Lockerby has wireless coverage throughout the school. Laptop students can enjoy Internet connectivity regardless of where they wish to work: library, cafeteria, or even in the stands while watching a game. Do I really need a laptop for this program? Yes. Laptops will be used everyday. Students who are without a laptop for more than two or three classes can expect to fall behind the class very quickly and their marks will suffer. What about Tablets or Smart-Phones? No. Tablets and phones are not capable of running the many types of software we use in our courses and therefore are not suitable for our laptop program. Are Apple (Mac) laptops allowed in the program? Do I have to purchase a new laptop? No. Laptops about two years old could still meet our minimum specifications. Do I need Internet access at home for the laptop program? No, however it is highly recommended. Can you tell me where I should buy my laptop? No. We can only advise that you comparison shop to get not only the best price but also the best commitment for service and repairs. We do recommend you stick with a recognizable brand name and consider buying an extended warranty and laptop insurance. Unless you paid extra for it, the anti-virus software that came with your computer will expire within three to six months. You are welcome to purchase your own anti-virus software as long as it comes with updates throughout the time it is used at Lockerby. We can help you install a free anti-virus program if needed. Why can’t I use a backpack that has a laptop compartment? We are very concerned about the weight students carry on their backs. Combining books with laptops is not healthy for the student nor is it safe for the laptop. In addition, in the interest of health and safety, backpacks are not permitted in classrooms. What does Lockerby do to protect its students from online threats? We have software that blocks access to inappropriate sites and we teach students about online dangers and how to avoid them. Can the school notes be backed-up? Yes. Lockerby uses the Google Apps for Education (G-Suite) environment which comes with plenty of cloud storage space. Can games be installed on the laptop? Yes. We do not allow game-playing during class time. Where do I go if I have a problem with my laptop? Our IT staff will be able to repair connection issues with our network. Teachers can provide required software. Hardware or configuration issues will most likely have to be resolved by your vendor.